The defending champion Boston Red Sox began their season in Seattle with a blowout 12-4 loss to the Seattle Mariners. After the Red Sox jumped out to a 2-0 lead, the Mariners took control by scoring seven runs over the course of the second and third inning. 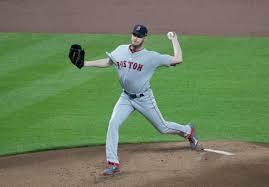 In his first start since his five-year $145 million extension, Chris Sale gave up seven runs in three innings before being pulled for Hector Velázquez. Despite poor pitching, the Red Sox offense was able to produce 11 hits.